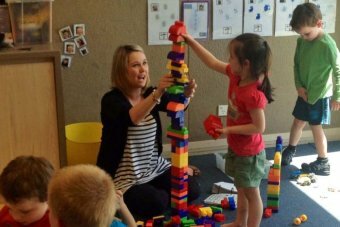 The Autism Early Learning Centre in Burnie, which supports 46 pre-school children, will only be funded until June.An autism centre in Tasmania's north-west is facing an unknown future after being given no funding guarantees by the Federal Government. Beyond that, ongoing funding will be assessed in the context of the National Disability Insurance Scheme (NDIS), the rollout of which begins mid-2016. The Federal Social Services Department said decisions on the centre's future will be based on a range of evidence. But the fact that the NDIS required services to compete in a demand-driven market has the centre's supporters worried. Kathryn Fordyce, who manages the centre, said she did not how it would adapt to NDIS requirements or whether it could survive without funding until the rollout starts. "I'm hopeful, and certainly our families really the support," she said. Autism Tasmania president Mick Clark said the centre needed immediate help to remove the uncertainty of its future. "There needs to be a funding package or some sort of bridging package that allows a transition for that to happen," he said. The Burnie centre was one of six set up by the Federal Government in 2010 and is the only one of its kind in regional Australia. Ms Fordyce said the centre offered a unique service in Tasmania. "Children can access intensive early intervention with access to a range of allied health and teaching professionals as well as having that day care component," she said. Colleen Cheek from the University of Tasmania has been studying how the centre alleviates the stress of travelling between different services. "Those unfamiliar environments can also be quite a challenge for children with autism and they struggle with that," she said. Theresia Williams said the centre was helping her son Alexander prepare for mainstream schooling. "Managing his anxiety has been a really big step and [he's] learning some skills in doing that," she said. Sophie King noticed a difference in her four-year-old son since he has been at the centre. "Eighteen months ago he hardly had any speech whereas now you can have a real conversation with him," she said. Burnie Mayor Anita Dow said the community feared a valuable resource would be lost. "At the moment we're concerned about the confirmation of the further funding post-June," she said.